Home » Series Previews » Who Is Matt Chico ? Who Is Matt Chico ? On Friday night the Mets send Oliver Perez to the mound against Matt Chico. We know who Perez is — most of the time, anyway — but who in the world is Matt Chico? He’s not the Chico who lives in the back of a van inside a garage (that was Freddy Prinze Sr.), and though he was born in Fullerton, California, his family has nothing to do with Chico State. Rather, Matt Chico is a little (5’11”) lefty who hadn’t pitched a game above AA until April 4th of this year. Originally a third-round pick of the Arizona Diamondbacks in June 2003, Chico was considered a bright prospect in the D’backs organization before being dealt to the Nationals as part of the deal for Livan Hernandez. Why he was considered an up-and-comer is not clear from his minor league statistics, which are pedestrian at best. 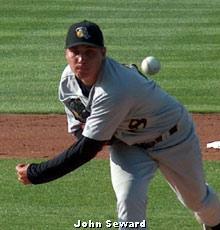 He pitched fairly well as an overaged A-baller in 2004 and 2005, but had an ERA soaring near six when promoted to AA in both of those years. Last year, as a 23-year-old, he started the year in A ball and again did so-so, going 3-4 with a 3.75 ERA in 10 starts. He went 7-2 in 13 starts with a sparkling 2.22 ERA for Tennesse in the South Atlantic League (AA) before the Hernadez deal, and pitched well in four starts at AA Harrisburg. He won a spot in the Nats’ starting rotation by default; his 5.16 ERA and 1.56 WHIP looked good next to the competition, which included retreads such as Jason Simontacchi, Mike Bacsik, Tim Redding, and Joel Hanrahan. Chico throws a two-seam and four-seam fastball, a curveball, and a changeup. The Nationals’ brass is high on the fact that he’s not a former borderline MLBer with a history of arm problems. Nats GM Jim Bowden proclaimed, “He has poise on the mound and the ability to go right at hitters.” Wow. Hmm … I’m not sure Matt Chico is ready to be mentioned in the same breath with Jeremy Bonderman — even if his makeup would impress Max Factor. Though he’d been known to hit 94 MPH in the minors, Chico’s usually in the low 90s with his fastballs, and relies more on keeping batters off balance with the curve and change. He’s considered a tough competitor — something of a bulldog — and in many ways, he’s the Nats’ version of Jason Vargas. Chico may eventually project to be a LOOGY or middle reliever rather than a starter, but as a 24-year-old lefty junkballer, he’ll be given every chance to become the next Tom Glavine or Jamie Moyer. At the moment, his 2007 ERA is 6.38 over four starts. He’s pitched five full innings only once this year, in a victory over the Braves. In 18 innings, he’s walked 15 and given up 23 hits, and struck out 12. Which means that he’ll probably look like Sandy Koufax against the Mets. Expect Matt Chico to baffle the Mets’ hitters at least the first time through the lineup, as our cagey veterans always seem to be thrown off by never-before-seen rookies (I like to call it “The Wandy Rodriguez Effect”). The second time through, however, let’s hope our sluggers figure him out, and keep him to his 4-inning-per-start average. I like our chances against the Nationals’ bullpen — even if Oliver Perez has a meltdown.